Energy and regeneration specialist ENGIE has landed a £3.9m construction contract in Rotherham, at St Bernard's Catholic High School. Financed by the Education and Skills Funding Agency (ESFA) Framework the contract has been awarded to carry out the extension works on behalf of the Department for Education and The Secretary of State for Education. TDR and Sun Capital, the previous owners of Keepmoat, the Doncaster-based affordable housing and community regeneration specialist, signed an agreement in 2017 to sell its regeneration arm to ENGIE, a French headquartered multinational firm, for an estimated £330m. The regeneration team, now known as Places & Communities, is based at offices in Manvers, Rotherham and was previously Bramall Construction. 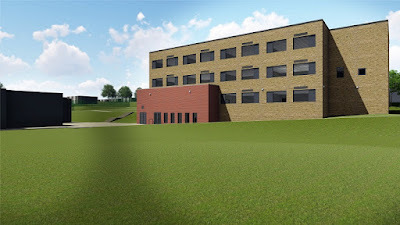 The project will see the construction of a new three-storey teaching block, creating space for 17 new classrooms to the rear of the school on Herringthorpe Valley Road, as well as the demolition of an existing classroom block. ENGIE will also expand the sports hall to create a studio for the school to offer further sports activities to pupils. Sean Corcoran, regional director at ENGIE, said: "We are delighted to have been chosen to carry out this vital improvement work at St Bernard's and look forward to getting started on site later this year. "We've worked extensively with the school during the tender period and we are sure that the students and staff will enjoy their new learning environment." Siobhan Kent, principal at St Bernard's Catholic High School, said: "We are thrilled to be working with ESFA and ENGIE in order to build outstanding facilities for our students here at St Bernard's. "It is a hugely exciting time for the school and our staff and students alike are looking forward to learning in a fantastic new environment." Residents are being invited to a planning consultation ahead of the regeneration work on Tuesday June 12 from 4pm to 6:30pm to find out more about the project and to ask any questions. Work will commence in November 2018.